Before construction could start we had to dig a well. Though our land was nominally within a housing development, it was a rather small one; basically a piece of wooded property surrounded by farmland that had been sold to a real estate company, which had divided it up for sale. But calling it a “housing development” is pushing it, since the usual infrastructure wasn’t available: no waterworks, sewerage, or gas lines. Technically, the land isn’t zoned for residences. It exists in that bureaucratic limbo known as shigaika chosei kuiki, which means an “area being adjusted for urban use,” but for all intents and purposes it’s land that does not have infrastructure but nevertheless is being sold for a profit. We cannot actually build on the land until the local land authority gives us permission, so buying it before the fact would seem to entail a risk, but these kinds of sales happen all the time and are always approved. We could see that for ourselves, since there were already five finished houses in this development and they had gone through the same thing. Over the past three years we had looked at many properties that were also classified as shigaika chosei kuiki, and in many ways they were more to our liking since lots that were already approved for residential construction tended to be in housing developments built by developers, meaning they were densely populated, and we wanted more breathing room. The thing about infrastructure is that most of it is built by private or semi-private entities who aren’t going to extend utilities to areas where they won’t see a profit, and a dinky little housing development of eight homes in an agricultural area where farming families have been living for generations without infrastructure isn’t worth it. Interestingly, the border of Chiba New Town is only a 10-minute walk from our property, and anything within that massive, 40-year-old development project, which incorporates portions of three cities, has access to all the usual infrastructure. But proximity means nothing. We might as well be living on the moon. Though we had already paid for the land and gave the go ahead to have the well dug, we called up the semi-public water authority whose bailiwick was closest to our property and asked about future prospects of waterworks being extended to our neck of the woods. We were essentially told that it would never happen. A little more research revealed that water usage throughout Japan peaked around 2001 and has been dropping ever since, and because local water authorities’ funding comes from customer billing and not from any public outlay they have less money with which to lay new pipe than they had in the past, so there’s absolutely no incentive to extend waterworks to any areas except those that guarantee a large customer base. As it turns out, the well-digging company our realtor recommended has some sort of familial connection to the mayor of our city, and in any case seems to be the only well-digger in the vicinity. 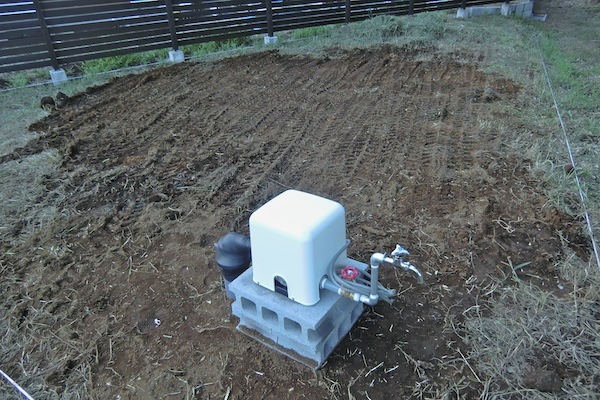 When we first inspected the land the agent told us that it would cost about ¥400,000 to dig the well, since the company charged ¥100,000 per ten meters and the water table below our property was about 40 meters deep. (Interestingly, we learned later that the water comes from Nikko, in Tochigi Prefecture, and not from nearby Inba Lake or Tone River) We went to our builder for a second opinion and they contacted a well-digger in Noda, who said that we should hire someone local, since it was important for the well-digger to have an understanding of the geological properties of the place he was drilling. That sounded to us like the logic of a closed industry whose members watched one another’s backs. We were stuck patronizing the local monopoly. When we first realized this was the case it blunted our enthusiasm for buying the land, since it effectively increased the price by ¥400,000 with no chance of negotiating a better price, but then we recalled that in almost any prepared subdivision where waterworks and sewerage are available, new property owners have to pay a fixed fee to “join” the waterworks, and usually this fee was is around ¥300,000. Furthermore, once the well was dug, the water was free in perpetuity (unless the folks in Nikko somehow found out we were tapping their aquifer and asked us to pay), while people hooked to public waterworks are billed periodically for the amount they consume. The tradeoff seemed fair, especially when the realtor told us that the city of Inzai would subsidize 100 percent of the cost of buying and installing a septic tank for us, since sewerage was available in other parts of the city but not in ours. We also found out a little later that this subsidy was dependent on availability of funds, that there was a set budget for septic tank purchases and installation within a given fiscal year, so we should make our application as soon as possible. As far as the lack of natural (or “city”) gas lines went, liquid propane gas delivery was available. LPG is safer and slightly less economical than natural gas, but we had already decided to make our home all-electric, so it wasn’t much of a consideration. Unlike the other three utilities, electricity is readily available everywhere in Japan, mainly because extending power lines is relatively easy and power companies always make back their investment. The decision to go all-electric also had an effect on our well-digging plans. Because we decided to avail ourselves of the EcoCute system, which uses heat exchange principles to heat water for the house in a more economical and, supposedly, ecological manner, we would have to purchase a special storage unit designed for well water. After the well was drilled a sample would be sent to the local land authority who would test it before issuing the construction permit, but the testing was also needed for the EcoCute system. If certain minerals were present in certain amounts it might undermine the system’s efficiency, and that would mean we’d need to install a filter. At first this news was further discouragement because it was yet another expense we hadn’t expected, but after a little more research we found out that the filter only cost about ¥70,000. Still, it was one more mechanical device with the potential of failing someday, so we were relieved when, after the well was drilled, the sample tests came back negative for the problem minerals; though at that point we were almost ready to install the filter anyway since our neighbor told us that the water he got from his well tasted bad and he only used it for washing. This was in contrast to another friend of ours who lived some distance away but also had well water, which she preferred to city water. As they say, there’s no accounting for taste so we decided not to install the filter in the end. Given all the mental energy we spent on the subject of water, you would think the drilling itself would have been momentous, and on the day the task was to be carried out we planned to go over in the afternoon to watch them do it. But when we got there it was done. In fact, not only was the pump installed and the ground smoothed over, the crew had already left. Obviously, drilling a well isn’t as big a deal as we thought it was. Interesting that you write propane is cheaper than Toshi gas. At least in Miyazaki it seems the other way around, though there is little choice as most of the “city” is propane. Now that we have moved to Fukuoka we have discovered how rare it is to find city gas. Unless one is living in Hakata or Chou ku, the equivalent of living in Ginza, it seems most people are hooked up to propane. Aphasia strikes again. Actually, you’re right, propane is slightly more expensive than city gas, and we knew that. It just didn’t make it to pixels in tact. Must be great to get your own house built that you can spec with insulation and double glazing. Ive been reading your blog for months now. Very helpful. We are also looking for a place to settle down. It’s a small thing, but I thought I would tell you anyway. I can’t drink city water cuz the chlorine makes me gag. I bought a Hurley water filter 3 years ago and they work great. No changing of filters and they will replace it with a new filter for $80 (I think) after 5 years. So basically, a 10 year water filter. To clean it, simply backwash it with hot water once a month. Cost is around $500. The main problem is knowing someone in the States who can ship it to you. You can buy them here it they are double the cost. Anyway, good luck with your new home. looks like a ‘cool’ piece of home tech. The basic fee is higher for propane (because you have the overhead of the truck coming around for the delivery), but the propane itself is cheaper. So there’s a crossover point at which propane becomes cheaper if you consume enough (as you might in winter). Interesting how these stereotypes (“the chilly, drafty Japanese home”) live on among expats long after they are no longer true. Even the cheapest pre-built home these days has foam insulation and double-glazed aluminum window sashes. They have for over a decade. You can see the silvery perforated band between the double-glazing from the outside of the home without even getting a realtor to show you the house. Check it out next time you wander past any new construction. Heated flooring has replaced double-glazed windows as the current most popular “extra” you get if you’re speccing a custom home. Sure, double glazed windows are available now…with aluminum frames that defeat much of the purpose of the double glazed windows….while the rest of the modern world have gone to argon filled windows with e-coating as a standard. Let’s not even get into insulation “options” and pricing. My dream is to import the critical bits of my house in pieces in a 20′ container or three. in that I realized with a bit of gumption (and skills!) one could actually “homebrew” a home itself! Prior to this, housing was something that just magically came to exist in my environment, seemingly beyond my personal powers to affect in any way. PVC sashes are indeed more insulating, but … they are PVC, which have their own problems, with rigidity and longevity (they’re plastic, after all, and they’re cheaper than aluminum). And they certainly do not defeat the purpose of double glazing. You might lose 5 or 10 percent of the theoretical thermal performance. Also, my point was not that double glazed and wall/floor/ceiling insulation is “available now” in Japan: My point was that its standard on virtually all new construction at all price points, now and for the last decade. There are no “options” to not have it, unless you custom build and stubbornly refuse it. Henry – you realize aluminum is used for heatsinks? If you take a look at the aluminum sashes on Japanese windows with a thermal imaging camera, you’ll see what chokonen is on about.